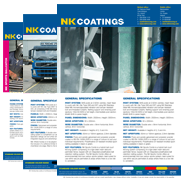 Powder Coating » NK Coatings | The market-leader in metal finishing services in Ireland. Powder coating is an advanced method of applying a high quality decorative finish to a wide range of materials and products that are used by industries businesses and consumers. Finely ground particles of pigment and resin are sprayed onto a surface to be coated. The charged powder particles adhere to the electrically grounded material and are fused into to smooth coating in a curing oven. Powder coating provides architects, designers and manufacturers with one of the most economical, long-lasting, and colour-durable quality finishes available. This modern surface coating system is a high-finish application that is extremely decorative and more resistant to chemicals, chipping, fading and wearing than other finishes. Almost every design palate is catered for with a wide range of colours, finishes and textures and the system can be applied to a variety of surface finishes and fabrication. As one of the fastest growing finishing technologies in the world, powder coating is also extremely cost-effective when set against labour intensive traditional liquid coatings. It is also virtually pollution-free, with very little wastage in the application process, containing no solvents and producing almost zero volatile organic compounds. Powder coating is finished to the British Standards BS EN 12206 : 2004 and BS EN 13438:2013 and, when applied to galvanized or aluminium materials, carries a guarantee across the full finish range. Click here to view the process of Powder Coating.